Terry still at it...after all these years! In 1978, our founder and President started Terry Elbourn's Engineering and Manufacturing Services, Inc. and named the business Teems, Inc. Terry put his many years of knowledge and experience as a manufacturing engineer to work in developing a diverse clientele of his own. Originally, Teems, Inc. was a job shop machine shop, with all manual mills and lathes. 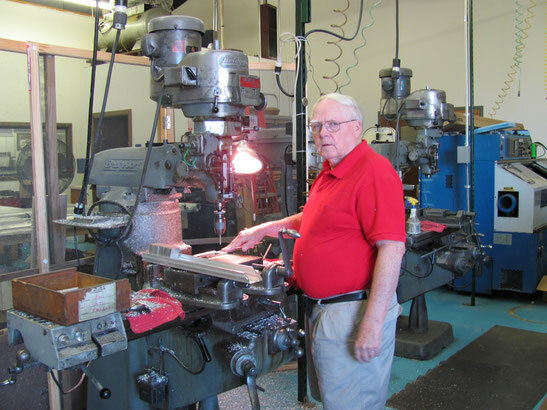 Terry quickly jumped into CNC machining and started producing a multitude of tight tolerance items, including those used in medical products, water monitoring components, Defense department components, oil and gas monitoring parts, and eventually fire suppression equipment for the US Forestry Service. Along the way, Teems, Inc. started to manufacture and design sign components and eventually moved into the sign manufacturing business completely. Teems, Inc. was the first to design and manufacture a truly viable illuminated directory that was less than 4 inches deep: long before the ADA regulations came out that required cabinets to meet that requirement. Our original intent was to design an illuminated directory that could be fully recessed into a standard 2x4 stud wall, while providing full illumination in a very confined profile. Terry's forward thinking designs produced the extrusions that we still use today. With this same shallow cabinet, we build both large and small units because of the strength of the original design. Teems, Inc's other complimentary extrusion designs have made the base directory very versatile and applied in a wide variety of designs and installations. In 2006, Teems, Inc. moved from Southern California to Longmont, Colorado. We made the move in order to gather family together and as a quality of life change. Teems, Inc. is a family owned and operated business that still believes in answering our own phones and developing quality relationships. We look forward to being of service in the very near future!